Lest we forget that there are fads in food as well as fashion, Candyboots is happy to take us on a trip down memory (or hangover) lane). Classic Diet Recipe Cards from the 1970s and (even better) a slide show of the cards themselves. There's Rosy Perfection Salad, a concoction of what looks like jellied red cabbage. 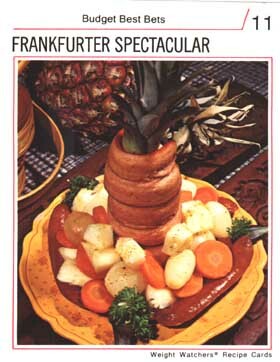 There's the fabulously Frankensteinian hot-dog sculpture dubbed the Frankfurter Spectacular. And there's Slender Quenchers, or what McClure calls "the saddest diet drinks ever." bq. Women could vote by the 1950s, and they could drive cars and work for wages, but they weren't supposed to eat like men, much less look as though they did. Canned and frozen products, food that had been stripped, sanitized, and rendered lifeless, was perfectly suited to the kind of women shown in the ads for refrigerators and ranges, all smiles in their aprons and high heels . . . Whipped cream, maraschino cherries, quivering gelatin salads — by midcentury the link between femaleness and weird, gaudy dishes of no recognizable provenance was a culinary assumption as inevitable as the pairing of salt and pepper.